Any pilot who flies a Mirage III, Mirage F1, or Mirage 2000 will always tell you of a small (but not cramped) cockpit, logically laid out instrument panel and ergonomically designed controls. The Mirage 2000 instrument panel slopes down sharply either side of the HUD (Head UP Display) and offers the pilot a very good view forward. The canopy sill is fairly low (well below the shoulder,near the elbow) and doesn´t hinder the pilot´s sideward view, and even rearward, the view is quite good. 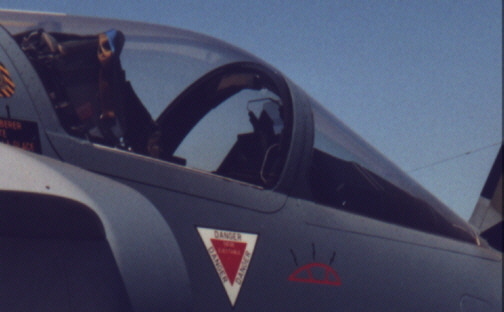 (The F16 bubble canopy, although offering a better view to the rear, is very heavy and should it be scratched, requires the replacement of the entire canopy). Even a fleeting glimpse reveals the extent to which Dassault has redesigned the instrument panel. The previous conventional displays have given way to three flat-panel colour displays and a head-level display that delivers external pod imagery. The Dash 5 is the first production fighter in the world to be equipped with Liquid Crystal Display (LCD) displays (the flat displays equipping the F18C are CRT displays). The 2000-5F uses the Sextant MFD 55 LCD unit. This suite, designed by Sextant, is collectively called Comète. The new cockpit displays together form the APSI(Advanced Pilot-System Interface) that Dassault believes is necessary to maximise the pilot´s SA (Situational Awareness) that, nowadays, means the difference between "Mission accomplished" and "Missing in Action". The prototype instrument panel coaming was dominated by a large, transluscent green HUD. It is noteworthy that no production Dash 5 has such a display. This indicates that despite the enhanced multirole capabilities, France, Taiwan and Qatar use their Dash 5 planes primarily in the air defence role.